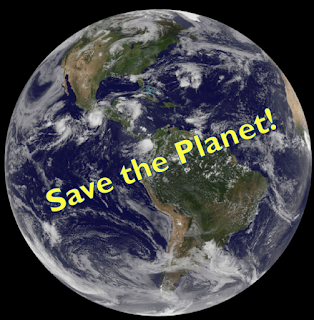 One hears a lot of Doomsday pleas that we should cut back on our consumption of carbon fuels, eat less meat, fish less, and so on--or else! Or else what? Or else, as it's often expressed, we'll destroy the planet! Scientists speaking to each other about agricultural sustainability or climate change use less excessively inflammatory rhetoric, though even they can engage in catastrophism when the public media cameras are on. Concern for the future is understandable, but exaggeration is not sensible if you stop to think about it. Crying "Wolf!" can backfire, because the Earth is not in imminent danger! Human activity, even if we let our population rise to 10 or more billion and burn every single last chunk of coal and drop of oil, will not destroy the Earth. No amount of energy conservation and sustainability will save the Earth from destruction, because it's not headed that way anyhow, and people haven't the power to destroy it (though, would we be able to come close with a nuclear WWIII?). Indeed, it's possible that imminent catastrophe rhetoric reinforces the reactionary view that this is scientific nonsense and we should just close climate-change government-sponsored web sites and de-fund environmental science. Part of the problem is that this is like the frog in a boiling kettle: the water gets hot so gradually that the frog doesn't notice it until it's too late. We humans are not very good at long-term thinking or planning, perhaps because longterm thinking wasn't possible or useful as we evolved, when each day's food, safety and mates were what was at stake. When change is slow, as global warming is, people often feel less inclined to self-denial today in exchange for a viable tomorrow. In addition, sociologically speaking, climate change messages can be seen as a scientific or 'left-wing' elite telling everyone else that they have to scale-down, while at least some have noticed the fact that the same elite fly all over the world to have meetings, promote their books, and deliver their message (and flying is among the worst CO2 polluters). In fact, most of what is being said by science, even taking scientists' vanities, frailties, and grant-hungers into account, is basically right. The climate clearly is changing, the seas rising, agricultural patterns changing, many species endangered. Of course, there have always been changes in patterns of rainfall, temperature, and vegetation, though the time scale generally has been glacially slow, so to speak, with the possible occasional exception of major meteorite strikes or huge volcanic eruptions etc. The current speed is one reason human activity seems surely to be at least partially responsible. Another important point isn't that climate is changing, but that the pace we're seeing today may not be reversible even if our behavior is contributing, because our ability to change the course of geoclimate might be limited. But that doesn't mean that the science-deniers and their ilk hiding their head in the sand are right. They're as self-willed ignorant as scientists say they are. They are pretending that the science is wrong, when the real truth is that they don't like the answers the science is giving us. If climate is always changing, and Save the Earth is a misleading slogan, the problem is that even if the Earth is not in danger, we are! And that is the very, very personal and selfishly short-sighted reason that we should slow down global warming if we can, increase use of renewable energies, keep funding climate sciences, and so on. Let's take a look at the wolf that really is at our door, and making enough evidentiary noise that we can't miss it. What is at stake is not the Earth, but the kind of constancy we, like any species, rightfully feel comfortable with. 1. Threatened lifestyles. On the more mundane side, having to change where and how we live, what we eat, how we interact with each other, and so on, are major dislocations of lifestyle. Being animals, we like our 'territory' to be familiar and feel safe. The levels of ill-will and unhappiness that would ensue major cultural upsets due to climate change and its consequences, would be upsetting to a great many people. There may indeed be changed patterns of wealth, lifestyle, disease in us and/or our animal and plant food sources. We may exhaust some minerals vital to our technological support systems. Even peacefully, gradually adapting to a lower-consuming lifestyle could avoid this, but would be disruptive; even if we lived very well in lower-consuming times in the past, social and psychological factors will be strained if our life-ways are changed too much or too fast. 2. Mass dislocation. Most cities and urban concentrations are near natural waterways. That's because they were founded over many centuries when water-borne trade and transport of goods etc., the stuff that makes concentrated populations possible, was the only real means of large-scale transportation. So, if water levels rise along coasts and major lakes or rivers, or if waterways dry up, there will be dislocations that make todays middle east refugees look like tiddly-winks by comparison. If tens of millions of Londoners and New Yorkers (not to mention residents of China or India) need to relocate, they'll have to go where there already are people. This mass internal migration will be seen by the 'recipients' as 'Yugely' more of a threat than refugees today pose. 3. Exacerbated inequality and suffering. Other large-scale dislocations of many sorts will mean economic deprivation for some who were well off, and new privilege for others. Climate change alters agricultural areas, drying some up and making others flourish. Food being one thing people really do fight over, one can anticipate major economic dislocation and very large-scale competition for the new food producing areas, by those whose breadbaskets dried up. This means war and potentially on a massive scale. With 10 billion people, and industrial-scale weaponry (including nukes), the suffering will potentially be massively unprecedented. In the overall scheme of things, a few island populations imminently needing relocation is an enormous event for the islanders but not a terribly large event globally. But when cities become inundated, and food hard to come by, when refugees number in the many millions, and they're armed, well, that may be a definition of Arm-aggedon (forgive the pun). We should be talking turkey to the public. Even if climate change is human-accelerated, it is not the first time there has been major climate change. The Earth, and even the human species, will survive it. Scientists should not be pressed by the intentionally uneducated into over-stating the case. The planet is not in danger. But in a sense there really is a wolf knocking at the door, and it is worth saving the planet as we know it. What is in danger is our way of life. And that's something humans kill for. No mention of the rights of other species to exist in the face of the human forced 6th mass extinction. Overly reliant on an ethics of anthropocentism; the dilemma is not quarantined to human survival on a denuded planet, but reaches to a morality that considers the intrinsic value of every other living thing and ethical imperative to walk-back the human-project to a level that does not impede prosperity for other species and ecosystems. Unless your comment comes from a religious doctrine, it reflects a personal judgment about things, and there is of course no problem with that. However, this post was intended to deal with, as you say, a human-centered perspective. One of my intents was to show that the 'Earth' per se is not in danger from us, but our way of life is. That many other species are being ravaged by our activities seems true, but is a separate point. I think those who don't want to cut back their lifestyles or acknowledge human-induced climate change have little sympathy for tigers, gorillas, Houston toads, and the host of other endangered species. But another point is that extinctions do happen, to every species, with or without human intervention, so that this post was about our custodianship of the planet from our personal rather than a global biosphere perspective. More than 25 years ago, science educator Rodger Bybee wrote two papers on the state of science education with a proposal for a change in emphasis. In that paper he noted that students would be facing problems of lifetime, lifespace and lifestyle or as you put it about our way of life. These problems which embody our way of life are deeply threatened by GCC. It is clear to some, less clear to others and denied by way too many. Michael Specter in a recent entry in The New Yorker (February 3) wrote "Denialism--whether it stems from suspicions from vaccines, dread of G.M.O.s, or even confusion about climate change--is often rooted in fear. And fear needs to be taken seriously." Specter also thinks that Trump's denialism "is not based in fear, it's based in arrogance." In any event both can kill us. The prompt for Bybee's paper may have been the opening sentence in Robert Heilbroner's "An Inquiry to the Human Prospect." Heilbroner who was one of the darkest of economists, asked in the opening "Is there hope for man?" I remembering wondering why people would read further. The answer is clear in the question. Sadly, I'd go a lot further than you have done. Denial or suppression of facts is not at all new. One bit of evidence is the longstanding word 'propaganda', but religious dogma and suppression of dissent (to wit, burning at the stake) is age-old. Use of ideologies by the few at the top to suppress the rest is the oldest trick in the societal inequity book. Scientists are people with egos and, these days especially, a need to hustle and self-promote so that climate and other issues are vulnerable to overs-statement. And there's the value judgment that we make related to why some might feel nostalgic about endangered species.